There are two primary products in the 1-2-3 Door Shield® door protector product line: The Protector Series and 200 Series Door Shields. Both the Protector Series and 200 Series are pre-assembled and can be easily re-folded and secured for easy transport or storage for re-use. Door Shields are packaged in 5-unit cartons. The Protector Series is our most durable Door Shield and is the product many commercial builders use to protect vulnerable doors. It is a two-ply pre-engineered product that will withstand in excess of 400 psi of burst pressure. The Protector Series is packaged in five-pack cartons with ten boxes per pallet of 50. All of our pallet shipments are corner protected and stretch-wrapped. The Protector Series can be purchased in single-pallet 50-unit orders for sizes 3070 and 3080. We also manufacture a Protector Series Door Shield to fit 4080 doors. The 200 Series is a lower cost version of The Protector designed for the residential and home-improvement markets and is currently available only in 3070 and 3080 sizes. It is a one-ply pre-engineered product that will withstand about 200 psi of burst pressure. The Door Shield® 200 Series is packaged in five-pack boxes with sixteen boxes per pallet of 80. The pallet is then corner protected and stretch-wrapped. 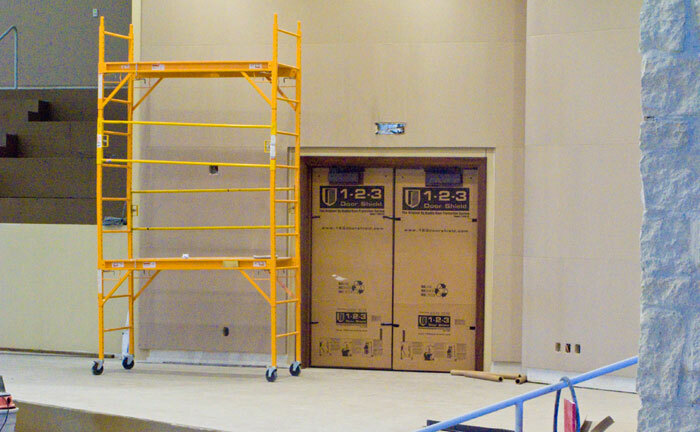 With sufficient prior notice, and at a small upcharge, we can customize 1-2-3 Door Shield to fit any size door, including taller doors (using an optional accessory). Please give us a call for with details of your needs and we will provide a quote to address all the doors you want to protect. Click here to see how our pre-assembled door protectors work!